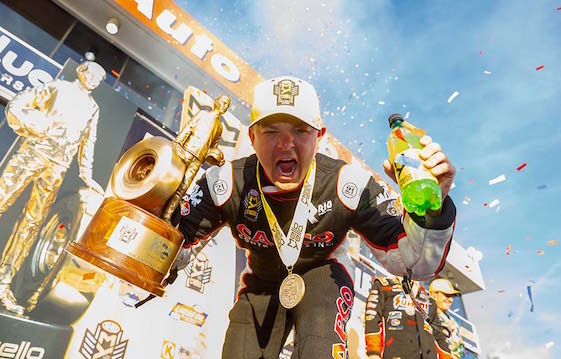 Midway through the NHRA’s Countdown to the Championship, Steve Torrence possesses a 42-point lead in Top Fuel, but the Texas native believes it’s the length of time his team has worked together that eventually will make the difference in the title battle. Torrence’s team is located in Brownsburg, Ind., where about 90 percent of the Top Fuel teams are based. However, it hasn’t experienced the crew hopping that often occurs when several race teams are located in the same area. It’s that relationship that Torrence cites as instrumental in the team’s consistency this season. Torrence finished third in last year’s standings and he believes his best-ever performance in the Top Fuel points played a key role in his 2017 success. In 21 races he has won eight events, been the runner-up three times and reached the semifinals on three occasions.